Kare started out in 1981 in Munich, Germany, as a business selling smartly designed shelving units for students. It was inspired by IKEA and its modular designs that were easy to assemble as they were affordable. Pretty soon, its creators realised there was a market for design that was stylish and beautiful yet affordable and evolved the business as such. Today, Kare is present in more than 40 countries, offering “Everything but ordinary” as its tagline and mission statement. The name “Kare” doesn’t really mean anything and is a play on the initials of the founders’ names — Jürgen Reiter, CEO and head of creative development, design and purchasing, and Peter Schönhofen, CEO and head of marketing, sales and franchise. Step into the store and it certainly feels anything but ordinary. Firstly, its storefront makes the shop look deceivingly small when in fact it covers 7,500 sq ft. 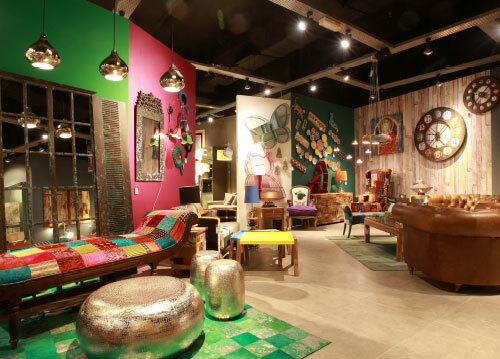 Inside, the retail space is a kaleidoscopic display of décor, lights and furnishings. The layout invites you to explore and discover, divided into sections curated to represent design concepts such as “Rock Star”, “Colonial/Cigar Lounge” and “White Diva”. The walls are painted in colours that are complementary to the themes they serve as a backdrop to. “At Kare, we don’t sell furniture — we sell concepts and lifestyle,” says Alicia Choong, Kare senior marketing executive. The sheer diversity of styles on show can be overwhelming, but if you take a deep breath and allow your eyes to drift around, there will be a piece that speaks to you. 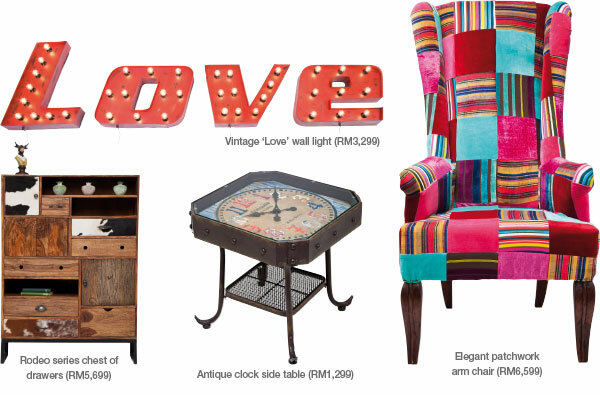 There are fine pony hair rugs and fibreglass figurines, gorgeous handcrafted wooden cabinets and coffee tables moulded from glass and steel, an installation of lights that spells out “LOVE”, an ottoman printed with the faces of The Beatles and a vintage armchair sporting elegant (and colourful) patchwork upholstery. It truly is a colourful cavern of treasures. Even then, not everything that’s available for sale is on display. According to Choong, some 5,000 items are rotated between the showroom and warehouse as the existing space isn’t enough. New stock arrives regularly and hot sellers are discontinued the minute the CEOs believe there’s more than enough of that design going around the world. services, there are two in-house designers you can consult if you need help with space planning and concept. There is an air of fun that flows through the store. The colours are rich and daring while piped-in music grooves to match the moods. It is welcoming and customers can play with, touch and feel any piece they’re curious about. Of course, the “once broken, considered sold” rule still applies. Overall, the effect is very theatrical. It opens with rows of shelves holding a range of decorative accessories, from funky clocks and artsy glass bottles to containers and figurines of every size and colour, and a main showcase, the headlining display that changes with the seasons — in our case, it’s the festive seasons such as Deepavali, Christmas and so on. During our visit, we saw a selection of green or easily matched with green pieces against a chartreuse wall — Hari Raya was just around the corner then. Beyond that is the main showroom where the drama begins. Let the various themes speak to your personality and draw you in. The divine and seductive White Diva will appeal to the woman who loves 1950s Hollywood glamour, built on a palette of white, facetted cut glass, mirrors and gilded lamps. Authentico offers a vintage feel with contemporary lines in wood, inspired by cool boutique hotels and stylish big-city apartments in design hot spots such as Amsterdam and Sydney. Colonial or Cigar Lounge is masculine and classic with lots of natural woods in dark colours and tanned leather upholstery. Vegas is luxury and opulence served against a backdrop of gold and champagne and mixed metallic colours while Fashion Rebels is a more eclectic expression, mixing vintage objects with ultra-modern pieces to create a new bohemianism. Be warned that the effect can be dizzying at first. The studio’s design philosophy is “furniture as entertainment”, bringing to life pieces that excite, inspire and “rebel against style dictatorship”. Reiter oversees creative development with creative director Wolfgang Hückelsheim, mastermind of all the beautiful things in the store. They work together with a large team of in-house designers to come up with some 2,000 new products and more than 10 trendshows a year. In Kare-speak, a trendshow comprises curated themes representing a certain lifestyle, feel or character under which the pieces are designed, and the design studio generates about 10 different references each year. In fact, the looks for 2015 have already been decided upon and their corresponding collections should be ready by the end of this year. There have been collaborations with exclusive designers as well, among them artist Andy Weber. This article first appeared in The Edge haven, on Issue #69 October + November 2014.